Castle Mills Bridge is a major waterways place minor waterways place place on the waterways major waterways place village town city on the River Foss between Monk Bridge (Upper limit of navigation.) (1 mile and ¼ furlongs to the northeast) and Foss Barrier (Flood water defence) (1¼ furlongs and 1 lock to the south). 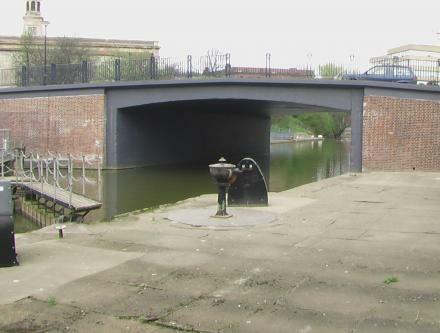 The nearest place in the direction of Monk Bridge is Piccadilly Bridge, York; 1¾ furlongs away. The nearest place in the direction of Foss Barrier is Castle Mills Lock Weir Entrance (Channel leading to the Weir - No Access); a few yards away. A very busy road - it was impossible to get a picture with no traffic on it. 7 Bishopgate St., York, YO23 1JH — 223 yards to the west. 90 Piccadilly, York — 57 yards to the northeast. 16 Pavement, York, YO1 9UP — 535 yards to the north. 6 Fishergate, York, YO10 4AB — 60 yards to the southeast. 23 Market Street, York, YO1 8 SL, York — 614 yards to the northwest. 1 Church Lane, York, YO1 9QT — 584 yards to the northwest. Coney Street, York, York, YO1 0 — 793 yards to the northwest. 4 Patrick Pool, York, YO1 8BB — 697 yards to the north. 2 St. Helen's Square, York, YO1 8QP — 826 yards to the northwest. 4 King Street, York, YO1 9SP — 460 yards to the northwest. Fishergate, York, YO10 4FD — 223 yards to the south. Station Rise, York, YO1 6HT — 946 yards to the northwest. 6-8 St. Helen's Square, York, YO1 8QP — 827 yards to the northwest. 46 Stonegate, York, YO1 8AS — 898 yards to the northwest. Silver Street, York, YO1 8RY — 623 yards to the north. 13-17 New Street, York, YO1 8RA — 724 yards to the northwest. Station Road, York, YO24 1AB — 1160 yards to the northwest. York — 1181 yards to the west. Station Road, York, YO24 1AB — 1205 yards to the west. York, YO — 502 yards to the north. York Museums & Gallery Trust, Museum St, York, YO1 7 — 1169 yards to the northwest. Church House, York, YO1 7HH — 945 yards to the north. City Wall, York, YO1 6 — 996 yards to the northwest. 12 Clifford Street, York, YO1 9RD — 422 yards to the northwest. 12 Walmgate, York, YO1 9 — 388 yards to the north. York — 833 yards to the northwest. Shambles, City Centre, York, YO1 7LZ — 656 yards to the north. 90 Piccadilly, York, YO1 9NX — 50 yards to the northeast. York — 1510 yards to the northwest. Blossom Street 5-9, York, YO241 — 937 yards to the west. Paragon St, York, YO10 4NT — 268 yards to the east. Cumberland Street, York, YO1 9 — 446 yards to the northwest. Eye of York, York, YO1 9RY — 145 yards to the north. York — 1468 yards to the northwest. Coppergate, York, YO1 9WT — 424 yards to the northwest. 1A Low Ousegate, York, YO1 9QU — 511 yards to the northwest. 13 Swinegate Ct East, York, YO1 8AJ — 711 yards to the north. 11 Little Stonegate, York, YO1 8AX — 803 yards to the northwest. 22-26 Back Swinegate, York, YO1 8AD — 801 yards to the northwest. 90 Piccadilly, York, YO1 9NX — 52 yards to the northeast. 53 Piccadilly, York, YO1 9PL — 118 yards to the northeast. 1 Tower Street, York, YO1 9WD — 313 yards to the northwest. Station Road, York, YO24 1AA — 1140 yards to the northwest. 42 Stonegate, York, YO1 8AS — 898 yards to the northwest. Tower Street, York, YO1 9SA — 223 yards to the northwest. Leeman Rd, York, YO264 — 1491 yards to the northwest. Museum St, York, YO1 7 — 1098 yards to the northwest. City, York, YO1 — 634 yards to the northwest.